High-speed Internet services using Wireless LANs are spreading rapidly. High-speed hot-spot wireless services are appearing in hotels, offices, and restaurants. 5-GHz Wireless LAN equipment and devices are being actively developed and there is urgent need for OFDM signal analysis. 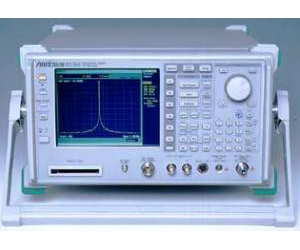 The MS2687B Microwave Spectrum Analyzer covers a frequency range up to 30 GHz and can measure up to 5th-order harmonics on 5-GHz Wireless LANs. Moreover, the MS2687B has a RBW up to 20 MHz and is ideal for measuring the burst power of wideband signals used by Wireless LANs. When the MX268730A Measurement Software is installed, measurements such as the modulation accuracy of each OFDM signal sub-carrier can be made at high speed and high accuracy.